The same could be said of those who heard him play. No matter how stormy the tale he’d weave, by the time he was through, the clouds had parted. Almost as well-known as King’s artistry and recordings was his prolific performing schedule. Director Jon Brewer’s 2014 documentary B.B. King: The Life of Riley, which featured appearances by Carlos Santana, Bono, Eric Clapton and Ringo Starr, detailed his non-stop touring, which at the time of his death had exceeded 15,000 shows. King outlived his tour manager, Norman Matthews, who died in May 2014. 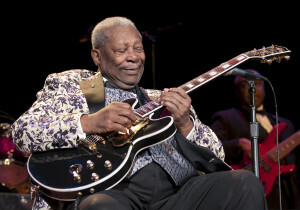 He received nearly every accolade in his field: 15 Grammy Awards (not counting a Lifetime Achievement nod in 1987); inductions into the Rock and Roll and Blues Foundation halls of fame; a Kennedy Center Honor; Presidential Medal of the Arts; President Medal of Freedom; the international Polar Music Prize; and honorary doctorates from Yale and Brown. 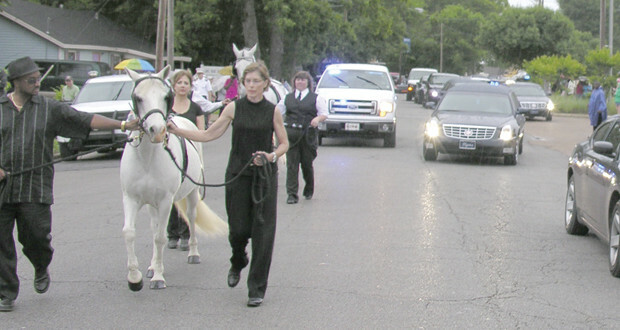 One of his most deeply affecting honors came in 2005 when the Mississippi state Legislature honored him with B.B. King Day. A segment of U.S. 61 (the legendary Blues Highway, which stretches from New Orleans to Minnesota) in Tennessee was named after him — an appropriate honor for a man who spent most of his life on the road. In 1956, he said he played 342 one-nighters, and he routinely did more than 200 gigs a year, tapering to 100 in recent years. His appearance at the 2013 New Orleans Jazz & Heritage Festival was a late-career highlight. King’s influence on other musicians is well-documented. In 2011, Rolling Stone magazine listed him at No. 6 on its list of 100 greatest guitarists, behind No. 1 Jimi Hendrix, Clapton, Jimmy Page, Keith Richards and Jeff Beck. Among the numerous acts he performed or recorded with were Hendrix, Clapton, U2, Bobby “Blue” Bland, Ronnie Wood, Derek Trucks and Sheryl Crow. King himself was influenced by bluesmen T-Bone Walker, Lonnie Johnson and Blind Lemon Jefferson, and jazz guitarists Django Reinhardt and Charlie Christian. He was also enamored with Delta blues players, including his cousin Bukka White. His constant companion, Lucille, is almost as famous as he is. 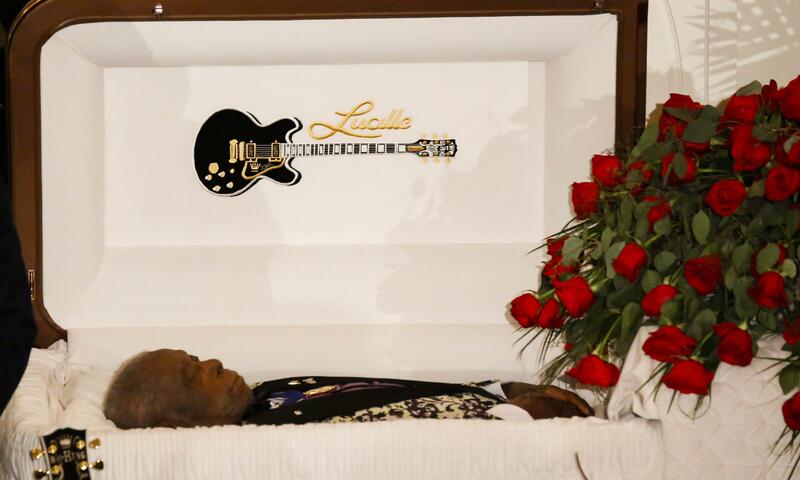 There were more than a dozen Lucilles (he often joked that he kept forgetting to return loaners to Gibson guitar company, when he sent his own guitars in for repairs). The original was named when he rescued the $30 instrument from a juke-joint fire, which started when two men fighting over a woman named Lucille knocked over a kerosene lamp. The name served as a reminder for him to never again run into a burning building, but King also liked the idea of seeing his guitar as a lady. Among the many tributes in the 2005 book The B.B. King Treasures, Santana recalls seeing King at a 1968 concert at San Francisco’s Fillmore auditorium. The show helped introduce him to mainstream rock audiences, and a year later he would open for the Rolling Stones on their American tour. King’s music was a unique blend of traditional blues, jazz, pop and swing. And although he was highly skilled on the guitar, he never learned to play and sing at the same time. His songs nearly always alternated between his rustic, crying vocals and his spine-tingling, bent-note playing, both accompanied by facial expressions that were at turns ugly and beatific. 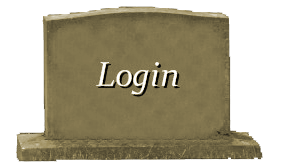 His itinerant musician’s life didn’t allow him to be much of a family man. He was married and divorced twice, and he reportedly fathered 15 children by 15 women. He confessed that his domestic life had been less than ideal. Riley B. King was born on a cotton plantation in central Mississippi just outside Berclair, on Sept. 16, 1925. His early life was hard. He was educated in a one-room schoolhouse and had to overcome a stuttering problem. His parents separated when he was 4 and his mother died when he was 10. As recounted in his autobiography, for the next four years he lived alone in his cabin, working the farm and picking cotton to support himself. His father came back to get him when he was in his mid-teens and moved him in with his new wife and kids, but Riley didn’t stay long. He soon returned to the farm until a tractor accident convinced him to take his guitar and the $2.50 in his pocket and hitchhike up U.S. 49 to Memphis. By that time, he was starting to gain proficiency on the instrument that he’d become enamored with when he was seven, after hearing a minister play. He made his own single-string “guitars” out of broomsticks and strands of wire until he bought his first real guitar for $15 when was 12. King got his big break on Sonny Boy Williamson’s radio show. He was called the “Beale Street Blues Boy,” which soon became “Blues Boy King” and eventually B.B. King. He became popular enough to get own sponsored radio show on station WDIA. He cut several records starting in 1949 for the Nashville-based Bullet label and some for Sam Phillips’ RPM label. It was there that he did Three O’Clock Blues, which stayed atop the R&B charts for 15 weeks in 1951. A long string of classics followed over the years, including How Blue Can You Get; Everyday I Have the Blues; Sweet Sixteen, Part 1; Please Love Me; Sweet Little Angel; and You Upset Me Baby. His biggest pop hit and signature tune was 1970’s The Thrill Is Gone, which earned him his first Grammy and was given a Grammy Hall of Fame Award in 1998. In recent years, his albums generally have won acclaim. His most recent studio work, 2008’s One Kind Favor, was produced by T Bone Burnett and won a Grammy for best traditional blues album. Earlier work, such as 1956’s Singin’ the Blues, 1965’s Live at the Regal and his 1974 collaboration with Bland, Together for the First Time … Live, are considered classics. But King was much more than a mere hit-maker — he was the pre-eminent blues ambassador, playing for presidents (George H.W. Bush played with him onstage after his 1989 inauguration, and Barack Obama sang with him briefly in 2012) and kings. 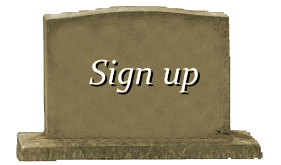 He kept in touch with fans through his annual B.B. King Blues Festival tour, which featured top and emerging blues artists, and his B.B. King Homecoming Festival in Indianola, Miss. Indianola is also the site of the B.B. King Museum and Delta Interpretive Center, which opened in 2008. Part of the museum is housed in the Last Brick Cotton Gin, where King worked in the 1940s. King, who picked cotton for 35 cents per 100 pounds and sang on street corners for dimes in his youth, never had to worry about people liking him whenever he played the blues. Friends and fans take advantage of the commemorative wreath in front of the museum to have their photograph taken after filing past B.B. 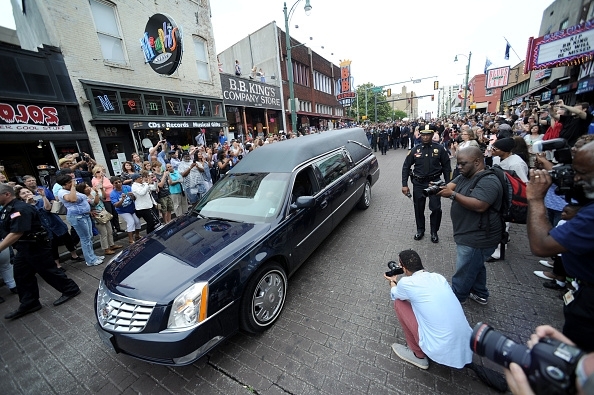 King's coffin during a public viewing Friday, May 29, 2015 in the B.B. 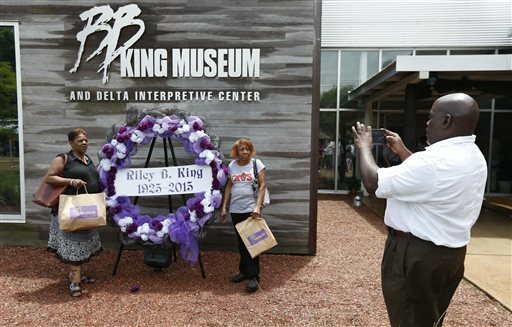 King Museum and Delta Interpretive Center in Indianola, Miss. The visitation comes a day before the funeral for the man who influenced generations of singers and guitarists.